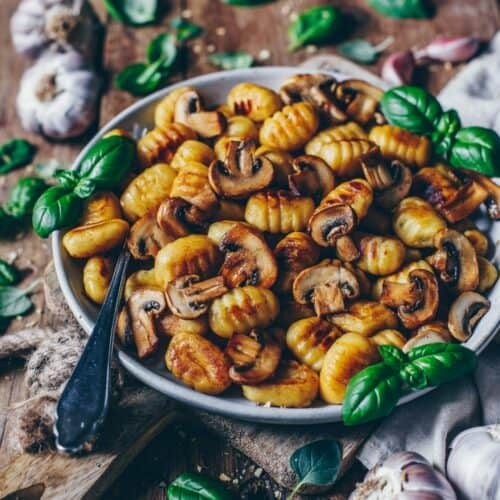 Hi my dears, today I want to share a simple and delicious recipe for Crispy Roasted Vegan Gnocchi (potato dumplings) that is definitely one of my absolute favorite dishes. I make this easy recipe so often and it never gets boring. For any reason, some people think Gnocchi are noodles, but actually, they are small potato dumplings. They’re just made of potatoes and a little bit of flour plus starch that helps the potato dumplings don’t fall apart. The classic Gnocchi recipe contains also eggs but if you make my recipe for Homemade Vegan Gnocchi, there are no eggs required! 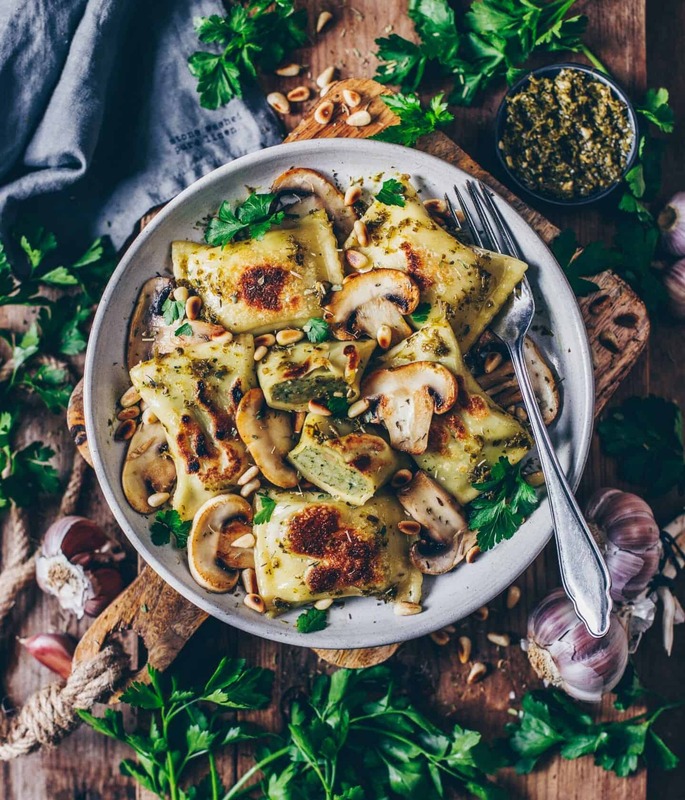 You can easily prepare your own and even vegan Gnocchi which taste as delicious as the regular classic potato dumplings. I definitely prefer to make these potato dumplings from scratch, since they taste much better in my opinion when they’re homemade. Also, I know which ingredients they contain because I can choose them. 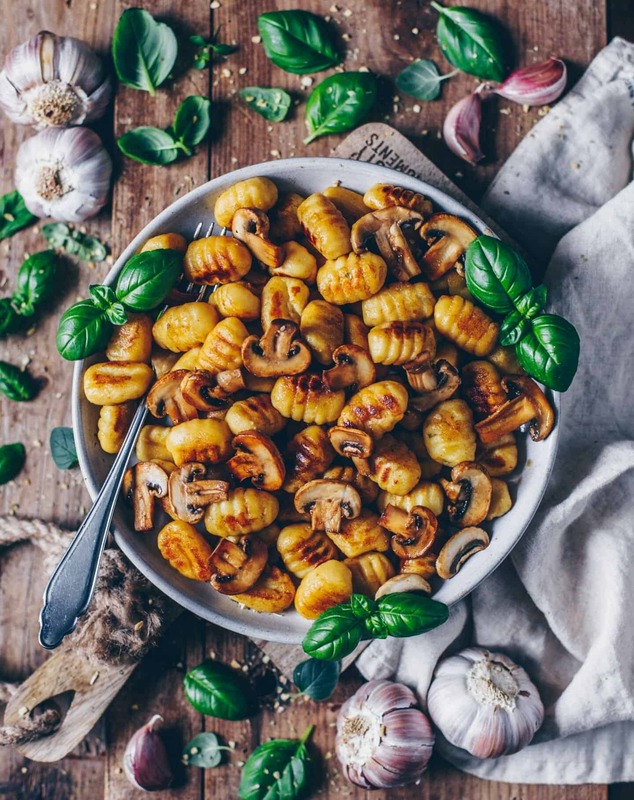 It’s also possible to make this Vegan Gnocchi gluten-free. Instead of all-purpose flour, you can substitute a glutenfree-flour blend. I usually prepare more of this delicious potato dumplings and then freeze them in batches, so that I always have some on hand when I want to serve a quick and easy dinner or lunch. 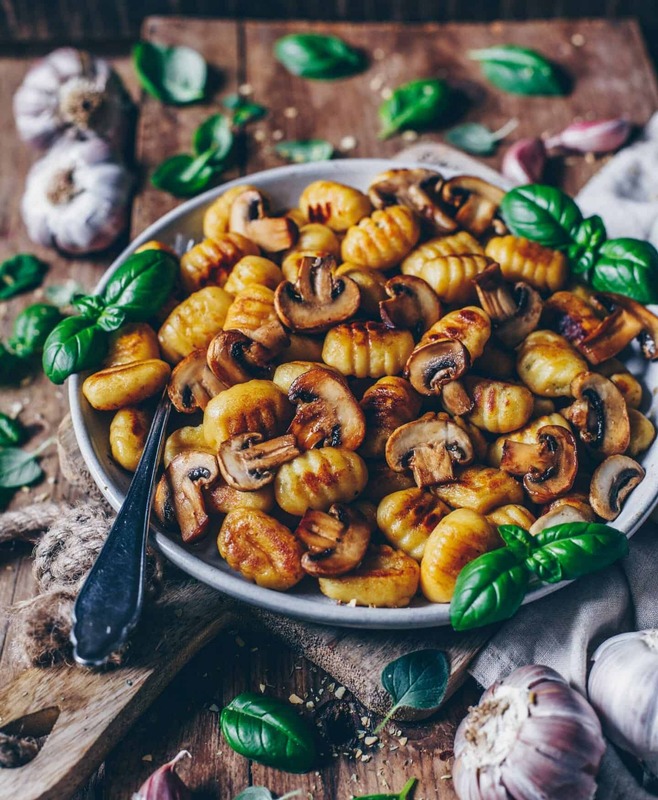 I like Vegan Gnocchi best when they’re crispy pan-fried with mushrooms, garlic, and pine nuts. Also, my beloved garlic basil-parsley pesto is a perfect addition to this easy recipe. If you want to serve this dish with other vegetables, you can head over my recipe for my Vegan Gnocchi vegetable stir-fry. However, these potato dumplings taste also very good when they’re just cooked. You can serve them with a delicious juicy tomato sauce (such as this creamy “cashew tomato sauce“) or my beloved Vegan Mac and Cheese sauce. It’s really a dish to die for and so easy to make! But now let’s finally get to the recipe. I hope you’ll love it too. Prepare Homemade Gnocchi with this recipe (or use store-bought Gnocchi). Peel onion and cut into strips. Heat up oil in a pan and roast gnocchi for about 5 minutes each side. Add garlic, onions and mushrooms and roast for 5-10 more minutes until goldenbrown and crispy. Season with salt and pepper. In the meantime toast pine nuts in another pan without oil. 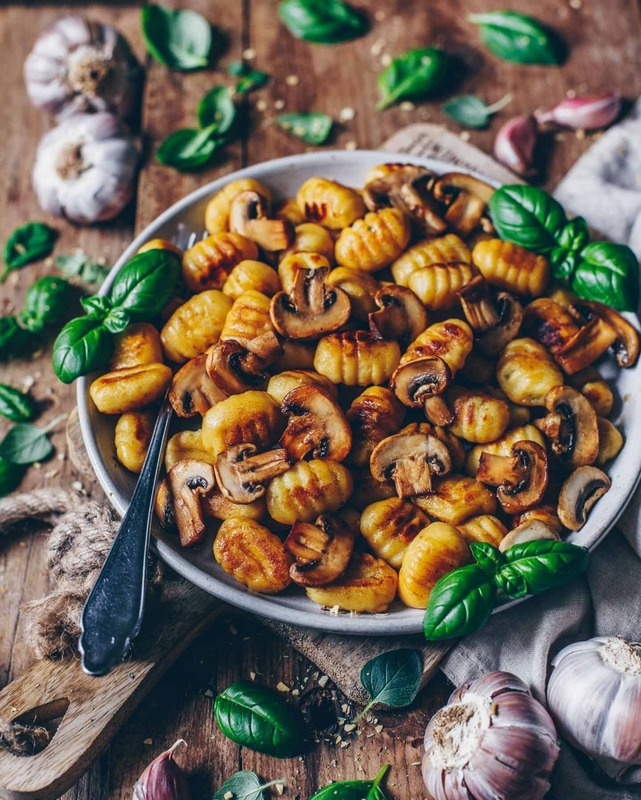 Serve your roasted gnocchi with the pesto and sprinkle toasted pine nuts, fresh basil (or other herbs of choice) and nutritional yeast flakes on top as desired. You could also use Sweet Potato Gnocchi to make this recipe. I added tomato, roasted minced garlic, and arugula and spinach to mine. This is DELICIOUS!!!! Thank you for sharing!!!! This combination sounds very good to me! I‘m pretty sure, it was super yummy ? Another great recipe! I’m totally in love with the combination of garlic mushrooms with roasted pine nuts. This is exactly my definition of comfort food! So glad to read that you like my recipes! Thank you so much for your positive feedback ? Garlic causes always a great flavor, right? I have made that recipe with a twist: adding chipolatas and removing onions. It was absolute pure yumminess!! Sounds like a good idea 😊 This recipe is so versatile. So glad that you tried another variation. I‘m happy that you like the recipe. Thank you so much! So happy that you liked this dish. Great recipe…. sehr lecker! Vielen Dank! This is soo good!! I tossed in some baby kale, too. Amazing! I don’t have yeast flakes, but I really would like to make that gnocchi 😍 can you tell me what I can add instead? You can also make this recipe without using them 😊 it’s just a kind of seasoning for a better taste. Absolutely delicious!! 🙂 added lemon juice , spinach and basil 🌿 and it was so good 😊 ! Definitely making it again ! !